GEORGE WASHINGTON THOMPSON was born in Sanford, Maine [Descriptive Roll; death rec] about Feb 1835 [1900 census], the son of Adrial and Hannah (Hazeltine) Thompson. 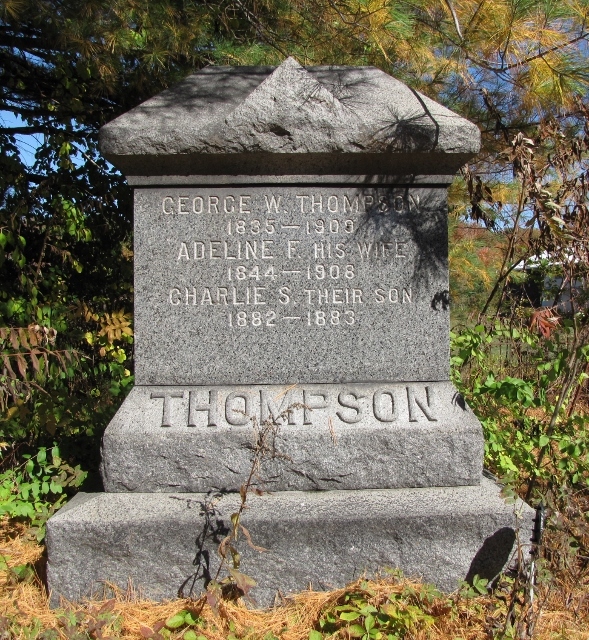 He died on 5 Mar 1909 in Sanford [ME vr], aged 73 yrs, 4 mos, 10 das from La Grippe and exhaustion, and was buried in the Thompson family cemetery with his parents [YCCI, pg 1732]. He was married, in Sanford on 13 June 1867, to ADELINE FRANCES ALLEN. She was born about Aug 1844 [1900 census] in Wakefield, NH [death rec], the daughter of Shadrach (Shadrick on her death rec) and Mary Allen. She died on 9 Apr 1908 in Sanford [ME vr], aged 63 yrs, 7 mos, 20 days, and was buried in the Thompson cemetery in Sanford [YCCI, pg 1732]. George and his brother Adrial Jr were both shoe workers in Sanford when they enlisted with the 27th Maine Volunteers for nine months. George went on to be a farmer, owning a place on High Street in Sanford. 1. Cecil Earl Thompson, b. 6 June 1896 in Sanford [ME birth rec]. He died in 1939, and is buried in Oakdale Cemetery, Sanford, in plot with his mother and her 2nd husband, Fred S Sherburne. II. GEORGE W THOMPSON Jr, b. Nov 1869 [1900 census]. Married by 1902 to MARY L CUSHING, the daughter of Charles L and Sarah (Alexander) Cushing. She was born in Portland (Long Island), Maine [birth rec's of children], date not known. She died on 19 June 1916 in Portland, and was buried on Long Island [death rec]. III. MARTHA "MATTIE" ADELINE THOMPSON, b. 13 May 1871 [ME birth rec; grave]; d. 8 Dec 1958 [YCCI, pg 1757]. She married GILMAN SHIRLEY PERKINS, the son of James G Perkins (who served in the 27th Maine), on 22 Dec 1900 in Rochester, NH [NH vr]. He was born 5 June 1869, and died 22 Feb 1960. They are both buried in Oakdale Cemetery, Sanford [YCCI, pg 1757]. They lived on Island Ave, Sanford [1910,1930 censuses], the censuses not showing them with any children. 1. Marjorie A, b. in ME. 2. Chester A, b. 18 June 1910 in Sanford [ME vr]; d. 12 Nov 1997. Bur in Houston, TX Nat'l Cemetery. He served in the US Army during WWII and in Korea. 3. Edward A, b. 6 Feb 1912 in Sanford [ME vr]; d. 4 Feb 1980 in Albany, NY. He was veteran of WWII, serving in the US Army. He was buried in Albany Rural Cemetery, Menands, NY.